I don't think I ever showed you pictures of my kitchen rug! It came straight from esalerugs.com and was shipped super fast- I was in love at hello. And here it is in all its glory on my kitchen floor. Well, I wouldn't exactly call what I have a kitchen- it's more like an apartment grade stove, fridge,sink and cabinets that don't shut properly. I try to make it a kitchen with the personal touches like this rug. Next up, working on updating the kitchen window treatment. Picking a fabric is easier said than done of course. PS- I have the BEST giveaway tomorrow, you won't want to miss it. I promise. Fantastic! I bought a rug for my entry from esalerugs and had a great experience, too. Love, love, love your rug, Linds. I looks great! I would love a rug like this for my kitchen! Oooh I love it! It adds so much pizzazz. Fabulous! On my way to see esalerugs!! It looks so wonderful in your kitchen! Ahhh! It's gorgeous!!! I want one! Oh it is gorgeous! I love it! Thanks for sharing! Love esalerugs! They are the best. Great rug. very nice... great colors! can't wait to see your reveal for the window treatments! It really warms up the kitchen and adds character. Love it! Thanks for sharing and oh! Did I read giveaway? This rug is GORGEOUS! 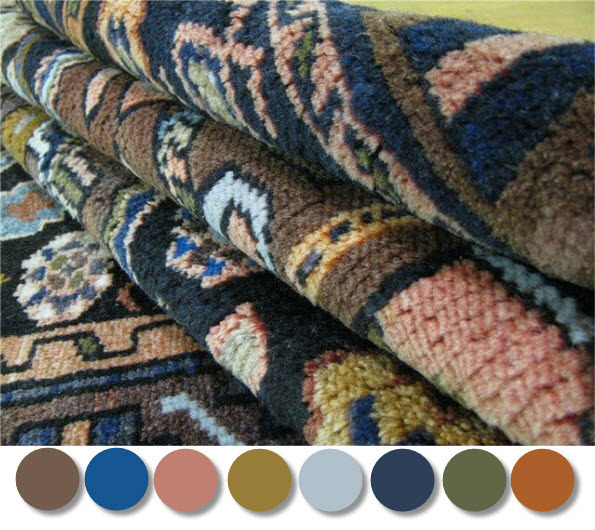 I love seeing how online rugs end up looking in real rooms, because it can go either way, but this one totally wins!